PARIS, AFP: One of the leaders of the “yellow vest” anti-government demonstrations was detained by police in Paris late Wednesday for organising an unauthorised protest, signalling a harder line by the authorities against the movement. 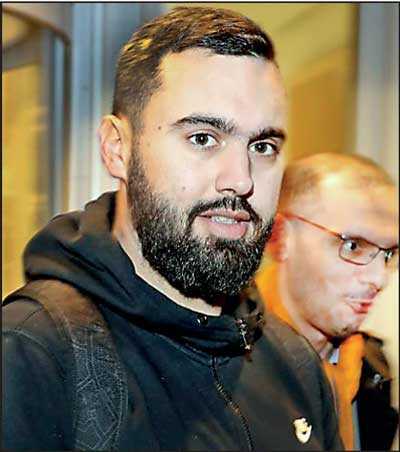 Eric Drouet -- who already faces a trial for carrying a weapon at a previous protest -- was held while heading for the Champs-Elysees, which has been the scene of violent clashes over the last month. “It’s called respecting the rule of law,” Economy Minister Bruno Le Maire said on Thursday as he defended the arrest which drew criticism from some leftist opponents of the government. “It’s normal that when you break the laws of the republic, you face the consequences,” he added. A few dozen demonstrators had gathered outside a McDonald’s restaurant near France’s famous Arc de Triomphe war monument and had been waiting for Drouet to arrive early Wednesday evening. Drouet, a truck driver who appears on television as a spokesman for the “yellow vests”, had called for the demonstration in a video posted on his Facebook page. The “yellow vest” demonstrations -- so-called after the high-visibility jackets they wear -- began in rural France in November over fuel taxes and ballooned into a wider revolt against President Emmanuel Macron’s policies and governing style. The protesters, who have repeatedly flouted laws that require them to declare their demonstrations in advance, have regularly clashed with police in Paris and other big cities. Drouet, who was filmed on Wednesday night being forced into a police vehicle by dozens of riot police in protective gear, was first arrested last month after he was found carrying a wooden stick at a demonstration. He faces trial on 5 June for “carrying a prohibited category D weapon”, a judicial source told AFP. One political commentator on the BFM news channel, Bruno Jeudy, said the arrest risked turning Drouet into a sort of “martyr” at a time when the “yellow vest” movement appeared to be running out of steam. Only a couple of hundred people turned up for the last round of demonstrations called on the Champs-Elysees on New Year’s Eve. In mid-December, after weeks of violence, Macron scrapped unpopular fuel tax rises in response to the protests, promised extra cash for minimum wage earners and tax cuts for pensioners.